What is body mass composition? Body mass composition is a way of measuring your weight that takes into account your overall fat to muscle mass to water ratio. It provides a guide to how much body fat you have, and eliminates the confusion that can occur from muscle weighing more than fat. The American Dietetic Association recommends that men have 15-18% body fat and women have 20-25% body fat. Why is it a good guide to health and weight loss? It is a far more useful and motivational tool for long-term weight loss than only using kilograms and pounds. If you rely on scales to assess the success of your diet and exercise programme, you are not taking into account the way your body composition is changing for the better, even if you are not losing weight. Lean muscle tissue weighs more than fat tissue, but leaves you looking much fitter and healthier. Measuring your body mass composition identifies these positive changes. Also, most sources agree that the human body requires a certain amount of fat for good health. Fat helps regulate body temperature, store energy, and cushion and insulate organs. By using a body fat monitor you can aim for a healthy fat percentage. The problem with these is they only tell you the body fat and lean muscle percentage for your upper body. The current will always take the quickest route back to its point and with hand-held devices the current goes up one arm, across the torso and down the other arm, completely by-passing the lower body. As a gauge of upper body percentage it is 99% accurate, but not so useful on a bigger scale! The same problem applies as above, except with these the current travels up one leg and down the other. Depending on where people store body fat, readings can be very inaccurate as a general guide to total body composition. These devices require the person to have two sensors attached to one arm and one leg on the same side of the body. This machine is 99% accurate in terms of readings. However, the cost of these machines is an unbelievable £350 - £750! 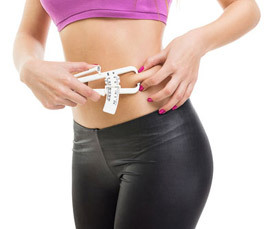 The best thing to do is to get your body mass composition measured by a fitness professional at a gym. They willl then also be able to put together a fitness programme that will match your particular needs.